Hello everybody and welcome back to Numismatics with Kenny. Here’s my second NumisNews video. For those who don’t know what NumisNews is, it’s a new format that I recently introduced. I pick an interesting subject that’s in a major numismatic publication and then make a video discussing and highlighting the key points. Today’s NumisNews focuses on the New York Bank Hoard that was graded by NGC. NGC, or the Numismatic Guaranty Corporation, has just finished grading and certifying a 16,000 Morgan Silver Dollar hoard that was found in sealed US Treasury bags. Left untouched for almost 50 years, the large hoard avoided the normal bag marks. 118 of the Morgans graded MS-67! 16 canvas bags were found in a New York bank vault, each containing exactly 1,000 Morgan Dollars. Here is a breakdown of how many bags of each date and mintmark combination were found. 1878-S (one bag), the 1880-S (two bags), the 1881-S (one bag), the 1883-O (one bag), the 1884-O (one bag), the 1885 (one bag), the 1885-O (two bags), the 1886 (one bag), the 1887 (four bags), the 1888 (one bag) and the 1889 (one bag). From 1964, when the bags were left at the bank by the US Treasury, the bags were passed down from owner to owner of the bank until the current owner decided to seek assistance about the coins. Jeff Garrett, President of Mid-American Rare Coin Galleries and former President of the American Numismatic Association (ANA), was called in to be the expert and was amazed to see such beautiful Morgans. He stated in an article for the NGC Weekly Market Report that “with each bag being opened, our small group was able to witness the reveal of a numismatic time capsule. The overall quality of the coins is amazing.” NGC graded each with a special label, noting each coin is from the New York Bank Hoard. At the time of this video production, NGC has not identified the name of the bank. Jeff Garrett had more to say on this exciting hoard. “The New York Bank hoard of U.S. Treasury silver dollars was one of the most exciting chapters of my numismatic career. Now that the hoard has been certified and pedigreed by NGC—and protected by NGC’s secure holder—the coins can be enjoyed by countless other collectors.” These coins will be available for the public to purchase from what NGC calls “major retailers” very soon. I credit NGC’s official website and coinnews.net for the information used in this video. Thank you to all of my first 500 subscribers. To celebrate, here is a video about the Three Dollar Gold Piece. 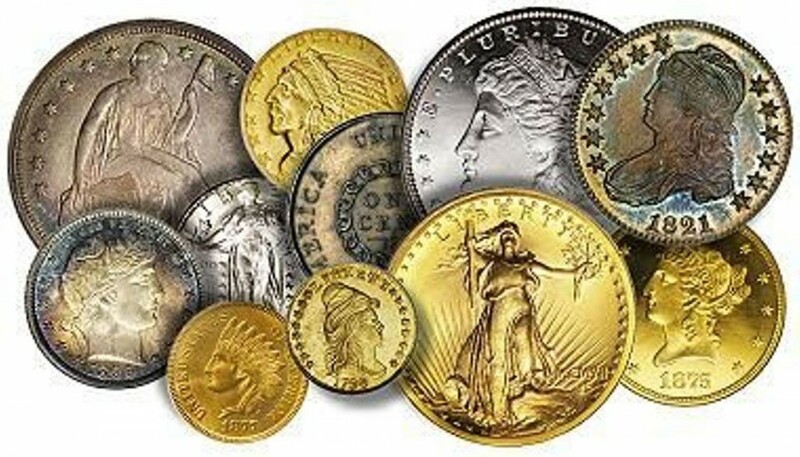 This video focuses on the Three Dollar Gold Piece. The coin was designed by James B. Longacre, who also designed the Indian Head Cent and numerous other coins. This series is especially rare – the highest mintage was in 1854, with only 138,618 coins struck. The lowest mintage was in 1881, with 500 coins struck. This is not including the unique 1870-S, which is part of the Bass Foundation Collection and can be seen in my video “Quarter Eagles and $3 Gold Pieces – Harry W. Bass, Jr. Collection at the ANA Money Museum”. Needless to say, every date and mintmark combination in this series is classified as scarce or above. The 1870-S Three Dollar Gold Piece is unique – there are no other ones in any collection. The coin was sold in a B&R auction in October of 1982 and sold for $687,500 in EF-40. Today, the Red Book estimates the price of the coin, in EF, to be about $6,000,000. The denomination was minted from 1854 to 1889. They were struck at Philadelphia, San Francisco, Dahlonega, and New Orleans. The coin was authorized for striking by the Act of February 21, 1853. Here is my latest ANA Coins for A’s video. I think it is a great way to get potential young collectors interested in coin collecting and a wonderful way to reward young numismatists. All the student needs to earn is 3 A’s and he/she will receive a world coin plus a free one year membership to the ANA. The coins get better and better each time you turn in your report card. They can earn a new coin for each marking period. If you are a YN or have a child, nephew, niece, or grandchild, let them know about the program. Home school children can also participate.